In this conversation, K.P. Yohannan, founder of GFA, shares about working together as one Body for God’s kingdom. Can you tell us something the Lord has been teaching you lately? Life is a journey. Throughout the Old Testament you will find every call God gave to people was a journey. It was true for Abraham, Moses, David and so on, and it’s true for us. You will find that not only in the lives of individuals, but also in the people of God as a whole. This past year, I’ve been on the most private journey of my life, and one of the things the Lord helped me see more clearly is that I’m just one person God is using to build His kingdom. God is working in each one of us, and at the same time, He is working through us and with us, using us to build His Church—visible and invisible. I am convinced the work God is doing is not going to be accomplished through me alone, because the Bride He is preparing is made up of a lot of people. And I must acknowledge every brother or sister who is doing their part, whether it seems big or small. A large puzzle may have tiny pieces, but if you remove those pieces, the puzzle is incomplete. Every piece is needed to complete the puzzle. I know we’re all needed to fulfill God’s purposes, but why can it be so challenging to get along with others? That statement changed my life forever. Now, every time I feel hurt, betrayed or misunderstood, I try to pause and say, “Lord, I want to be part of You fulfilling Your plan in their life. I don’t want to be the enemy.” And sometimes that means I have to embrace suffering to do that. But I also know it is actually part of the Lord’s plan in building their life. In my personal journey with God, how do I know I’m growing and that He is working in me when I can’t see it or feel it? In Philippians 2:12–13, Paul writes, “work out your own salvation with fear and trembling; for it is God who works in you both to will and to do for His good pleasure.” All of us need to walk in humility and brokenness every day, knowing God is changing us and making us more like Him. We have to remember God is working with us. Most of the time, God’s work is done silently. You may be praying quietly in the kitchen, and nobody hears that earth-shaking event that happened on the mission field as a direct result of your quiet prayer. God may not even show it to you. It’s a mystery in understanding the ways of God in this journey. Sometimes I have to completely throw my life in His hands and trust Him to fulfill His plan. Sometimes I wonder if I’m any use to the Body of Christ with all the failures and mistakes in my life. I have a lot of failures in my life that the Lord has used for the better. It is important that you and I come to the place of security and resting in the Lord and His sovereignty. In Acts 17:26b, it essentially says that before we were born God knew exactly where we would live, what our family life would be like, what incidents would happen to us, etc. This is all part of His incredible plan, and sometimes the greatest disappointments and setbacks are His ways of conforming us more into His image! In everything that happens to us, we should see it as the cup handed down to us by the Lord. It is for two purposes: 1) to make us closer to Him, which helps us understand Him more, and 2) to be united, to be one, with brothers and sisters to build His kingdom. That is how God has planned it throughout the Bible. Is there anything we should do as we continue this journey with our brothers and sisters? There are a few things I’ve learned from the book of Philippians that I think are very helpful for us to remember. Fight for the unity of the saints. If something has come up between you and another believer, sort it out. Don’t be secretive. Say what hurt you and talk it out. 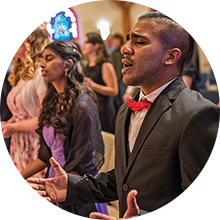 USA & CANADA – On Dec. 20, 11 students graduated from GFA’s School of Discipleship (SD), a year-long program designed to help young adults draw closer to God. More than 200 students have graduated from the program since 2004. Pastor Steve Marquez, senior pastor of Calvary Chapel Fort Smith, was the guest speaker for the 23rd graduation ceremony in the USA. He continued to encourage the students to stand firm in the Lord when difficulties in following Christ prevail. Jashubi spoke on behalf of the first-year SD students at the ceremony. During their SD year, students discover what it looks like to live out the Christian life they learn about in class. They learn valuable skills by serving in the office, side-by-side with staff members whose vision is to enable people in Asia to find joy in Jesus’ name. GFA SD in Canada also celebrated its fifth graduation ceremony with seven students participating. Anna spoke on behalf of the graduating first-year students. The river was busy. It was always busy during high tide. Boatmen competed with each other to ferry people and belongings from the market to villages and back. Some boats were so weighed down that the tops were only a few inches from the water’s surface. This was the way of life for people living near the shores, where channels of water sliced through the ground and boats helped people get around from village to village. But the Galilee Boat was different. It was just Pastor Myo Zaw and his disciple, Nyein Shein, on this boat. They traversed through the river together. Myo Zaw stood toward the front of the boat, a handwoven bag slung across his chest and packets of information about true hope in his left hand. Nyein Shein was at the stern, bending this way and that as he navigated the vessel through the murky waters, careful not to collide into other boats. For Pastor Myo Zaw and Nyein Shein, traveling through the waters was less about getting around and more about meeting people. 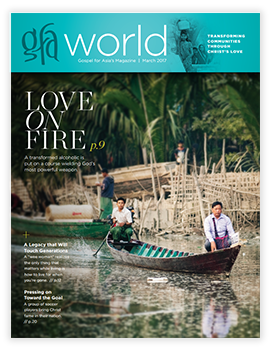 “Galilee Boat is like a second life for us, which is very important for our [ministry],” Myo Zaw said. The boat was a means to minister. It created opportunities for Pastor Myo Zaw to talk with fishermen or the men waiting to ferry people from the market. He’d also go to villages that could only be visited by boat. Three fellowships and 16 other smaller fellowships grew in villages that Pastor Myo Zaw visited via the Galilee Boat. The boat has become “famous,” Myo Zaw said. But not because it’s constantly traveling through the channels of water, looking to meet new people. It’s become famous because of the timely help it’s provided. The region where Pastor Myo Zaw and Nyein Shein serve is known to flood during monsoon seasons. When it does, they use the Galilee Boat to bring relief supplies, like food and medicine, to stranded villagers and to rescue people by transferring them to safer regions. “I believe God gave me this boat to help the community in the times of difficulties,” Myo Zaw said. And that’s where you’ll find him and Nyein Shein, out on the Galilee Boat, navigating the busy river to help people in their community. Khine Tun was what he called an “enemy” of the Cross. He didn’t aggressively oppose Christianity, but he didn’t believe what others had told him about Jesus either. He could be found “under the big trees and [near] big stones where we used to sacrifice chickens” to his god, he said. Then he met GFA-supported pastor Myo Zaw, who had traveled more than two hours by boat to visit his village—the only way to get there. Khine Tun heard him share a message he never heard before: There is a living God who knows you, loves you and wants to redeem you. But life for Khine Tun and his family of seven didn’t magically become easier after discovering and embracing the Lord’s goodness and redemption. He still lived in the same village, worked the same job, and had the same number of mouths to feed. Even now, Khine Tun struggles to cover the cost of educating his five young children. Being illiterate, he understands how important education is and does his best to make sure his children are able to attend school to learn what he was never able to learn as an orphan. But with little income and five children to provide for, it can be challenging. Though life has its struggles, Khine Tun has learned—in part through Myo Zaw’s teachings—to trust the Lord, and he depends on Him to take care of his family. “We are satisfied that the Lord gives us daily food,” he says. But more than that, Khine Tun carries with him the hope of his heavenly home. Rodney, a GFA staff member for 15 years, shares about the future joy of heaven and getting to meet the people whom he’s helped through GFA. I have often wondered what heaven will be like. What activities will our lives be filled with in heaven? Meeting Jesus face to face is at the top of the list. Another thing I am looking forward to is the relationships and conversations I will experience. I certainly will meet all of the “biggies”: Adam, Moses, the prophets, the Apostles and Paul. Then I will visit with family members and friends who are in heaven. Sadly, not all of my family will have made it. Next, I will trace my spiritual family tree: who led whom to the Lord until, finally, I was able to hear the message of salvation and enter into this life of grace, peace and purpose. Then, I will pierce the differences in language and culture to hear the remarkable stories of the young men and women I’ve seen at Bible colleges. Many of these brothers and sisters sacrificed much to attend Bible college and prepare for a life of sharing the Good News—and I presently have the privilege of being part of their lives and ministry and of helping to tell their story. I think of a young man I met who escaped beatings and abuse to arrive at the Bible college with only the clothes on his back. After three years of study, he was preparing to go to his ministry assignment. In heaven, I will finally be able to hear from him how the Lord used his life. Another group of people I hope to one day meet is the millions who have embraced Jesus Christ through GFA. I wish to hear their stories of despair turned to hope through Jesus Wells, GFA’s Bridge of Hope Program, the Christmas catalog and other areas of this ministry. This will take a while, but we will have eternity. 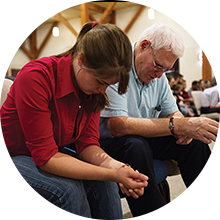 What thrills me about being part of GFA is that I have an outlet for my desire to see many come to the Lord. I am able to have my life count for eternity. I have personally witnessed the tremendous scope of the work the Lord is doing on several occasions, and I am extremely thankful God allows me to be part of it. All the villagers said it: Akshaya was going to die soon, just as her husband had. The young woman had gotten married without knowing her husband had HIV. In a matter of months, he passed away. The scourge that took her husband’s life soon began deteriorating her own. After contracting HIV, Akshaya grew weaker day by day. Three months later, she was bedridden, and all the villagers were convinced she would die soon. Then Jyotsna, the wife of GFA-supported pastor John, learned about Akshaya’s situation. Jyotsna and her husband took Akshaya to a premier hospital nearby to receive treatment. While Akshaya stayed in the hospital, Jyotsna, Pastor John and his congregation interceded in prayer for her. Jyotsna and Pastor John often visited Akshaya in the hospital, praying for her and sharing about Jesus Christ, the Healer who died to give her a new life. Gradually, these seeds of hope took root in Akshaya’s heart. After some time in the hospital, Akshaya’s health improved dramatically, much to the amazement of the doctors and the people in her village. Akshaya knew there was more to this recovery than doctors’ help. With restored health, Akshaya was able to work again, and she and her mother started regularly attending worship services at Pastor John’s church. Although Akshaya remains HIV-positive, she can live an active life, by God’s grace. Now Akshaya knows He brought healing and restoration not only to her body but also to her soul, and all the people in her village and the nearby villages know Jesus Christ saved her life from death. Akshaya is one of more than 2 million people in Asia who live with HIV. Contracted through various means, whether drugs or illicit sexual relationships, or passed on to spouses or children, this disease leaves many people with a mark of disgrace. Many HIV-positive people in Asia also lack access to the needed treatment. Please pray for them, that they will experience the redemption and hope found in the Great Physician, who offers healing and who has defeated the grave. King David prayed: “Search me, O God, and know my heart; try me and know my anxieties; and see if there is any wicked way in me, and lead me in the way everlasting” (Psalm 139:23–24). When we think about everlasting life, our minds automatically fast forward to the day we die, enter heaven and live with the Lord forever. David’s request to “lead me in the way everlasting” does not speak about his future life in heaven but the one here on earth. He understood he had to make a choice to walk on this earth in the world’s way or in God’s everlasting way. There is a huge difference between the two. The world’s way promotes ourselves and our own goals. Yet all the accomplishments and honours we achieve on this path will end when we die. Nothing will transfer into eternity. God’s everlasting way leads us to submit to our Creator as Lord and pursue His values and goals. It puts us on a path where our character becomes increasingly Christlike. And when we die, all the fruit we bear will transfer with us into eternity. God’s purpose in leading us in the everlasting way is to prepare us to be the Bride of Christ. Paul Billheimer, author of Destined for the Throne, says our life on earth is a classroom. All that happens here—good and bad, joys and disappointments, successes and setbacks—God uses to get us ready for this glorious event. Like Paul, we should come to the conclusion that whatever takes place during these few years on earth is just “momentary and light afflictions” (see 2 Corinthians 4:17) and is nothing compared to the glory that is going to be revealed in us. So with eternity in mind, God continually works with each one of us that we may have the quality of eternal life here as though we were already in heaven. Jesus, when He lived on Earth as a perfect man, lived with the reality that nothing He did was for time—it was all for eternity. Time for Him was only a limited period that allowed Him to fulfill the Father’s will for all that was to come beyond the cross. So if Jesus, our example, lived with such an eternal perspective, we too should be more deeply concerned about preparing our hearts for the invisible eternal world. When we ask the Lord, like David did, to lead us in the everlasting way, He starts us out at the very beginning of this path. He tells us “to do justly, to love mercy and to walk humbly with your God” (Micah 6:8). Our humility before God is absolutely necessary for any work God wants to do in our hearts. Knowing this, God arranges for us a classroom where we can practice humility, such as in our workplace, church and family. We may encounter an impatient boss, an unfriendly coworker or a hard-to-love Christian brother or sister. Let us not reject this training in humility, for it’s the foundation for every other eternal value God seeks to incorporate into our character. In our earthly classroom, God not only teaches us spiritual lessons, but He also tests us so we will know how far we have come with our transformation. David actually volunteered for such a test when he prayed “Search me, O God, and know my heart; try me and know my anxieties; and see if there is any wicked way in me” (Psalm 139:23). God uses adverse circumstances to test the quality of our character and the motives of our heart and work. We find an example for such a test in the story of the prodigal son. The older son appeared to be a perfect, godly, upright and hard-working young man until his younger brother came home after living in sin and squandering his inheritance. All of a sudden, the holy, wonderful older brother became so angry that he did not even acknowledge his own brother. Though the older brother had the appearance of godliness, the test revealed a heart void of love, compassion and forgiveness. David’s prayer for God to search his heart was from a deep desire to walk in the everlasting way. He wanted to be able to make corrections in his attitude and life until every minute he spent, every decision he made and all the work he did would have the quality of eternity. May this become the desire of all of us who follow Christ.